On the face of it, the female samurai warrior is a very elusive creature. The woman’s role seems to be exercised only behind the scenes: in palaces, council chambers, and living quarters where decisions were made, alliances arranged, and intrigues unfolded. As wives, daughters, and mothers, the women of the samurai class could exert a huge influence over the political process. In their less welcome roles as pawns in the marriage game, negotiators, or go-betweens, women also played a vital and hazardous part in the drama of Sengoku Japan. The samurai woman as a fighting warrior, by contrast, appears to be almost non-existent. 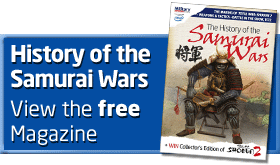 However, even though authentic accounts of fighting women are relatively few when compared to the immense amount of material on male warriors, they exist in sufficient numbers to allow us to regard the exploits of female warriors as the greatest untold story in samurai history. Over a period of eight centuries, female samurai warriors are indeed to be found on battlefields, warships, and the walls of defended castles. Their family backgrounds range across all social classes from noblewomen to peasant farmers. Some are motivated by religious belief, others by politics, but all fight beside their men-folk with a determination and bravery that belies their gender, and when the ultimate sacrifice is called for, they go willingly to their deaths as bravely as any male samurai. Other women achieve fame by employing their skills in the martial arts to seek revenge for a murdered relative; others seek mere survival and, when combined with the exploits of women whose role in warfare was of a more indirect nature, the female contribution to samurai history is revealed to be a considerable one. The reasons for female participation in battles may be summarised as follows: by and large, female involvement in conflict was of a defensive nature. Thus, apart from one or two ambiguous examples, there are no records of women being recruited to serve in armies or ordered to fight, neither do there appear to be any authentic examples of all-women armies. The usual scenario was that of a defended castle where the commander was absent and the responsibility for defence had to be assumed by his wife. In nearly all such cases, the castellans’ wives’ roles involved actual fighting as well as administrative duties, which suggests that women of the samurai class were highly trained in the martial arts to prepare them for exactly such an emergency. Invariably, this role was played either by the wife of the daimyo (the feudal lord) or one of his most senior retainers to whom the control of a subsidiary castle had been entrusted. Recent archaeological evidence confirms a wider female involvement in battle than is implied by written accounts alone. This conclusion is based on the recent excavation of three battlefield head-mounds. In one case, the Battle of Senbon Matsubaru between Takeda Katsuyori and Hojo Ujinao in 1580, DNA tests on 105 bodies revealed that 35 of them were female. Two excavations elsewhere produced similar results. None was a siege situation, so the tentative conclusion must be that women fought in armies even though their involvement was seldom recorded. Of those we know, the defence of Suemori castle in 1584 by the commander’s wife is as glorious an episode of samurai bravery as can be found anywhere. There really was no thing as a female samurai warrior. Hear me out. Samurai, as a term for warriors, is distinctly masculine. A female warrior was called Onna bugeisha. Samurai as a class in the caste system certainly applies to both male and female. Thus, your statement that they came from all different classes is inaccurate when referring to samurai. Samurai is a class. Most samurai class women were trained in some military arts, although more for hime defense than active battle participation. You are correct, howverx in that there were some numbers who did engage in mass war. What age could women start being an actual samurai?? they would “fight beside their men-folk with a determination and bravery that belies their gender” – sure, as women are known to normally be incapable of those features. douchebag. Agreed Fran. The comment stood out from the factual content of the article. The author would probably agree with the determination shown by – for instance- athletes of both genders and the ferocity of the female in protecting her young is legend but still the perception of ” the little lady ” who can’t quite cope with the big bad world . keeps hanging around There is a fundamentalist agenda in keeping this in place.